With the first Iraqi government forces entering Mosul’s outskirts, the Battle for Mosul is entering its more messy, chaotic, and violent phase as forces will enter more densely populated areas. With up to 1.5 millions civilians still living in the Iraqi city held by so-called Islamic State (IS), officials and aid agencies have warned for months that the operation to retake the city could have a high humanitarian cost. Dubbed Operation “We Are Coming, Nineveh”, the joint offensive by Iraqi government forces, allied militias, Kurdish Peshmerga forces, and the international Coalition started on October 16, 2016. It is the largest deployment of Iraqi forces since the 2003 United States-led invasion of Iraq. 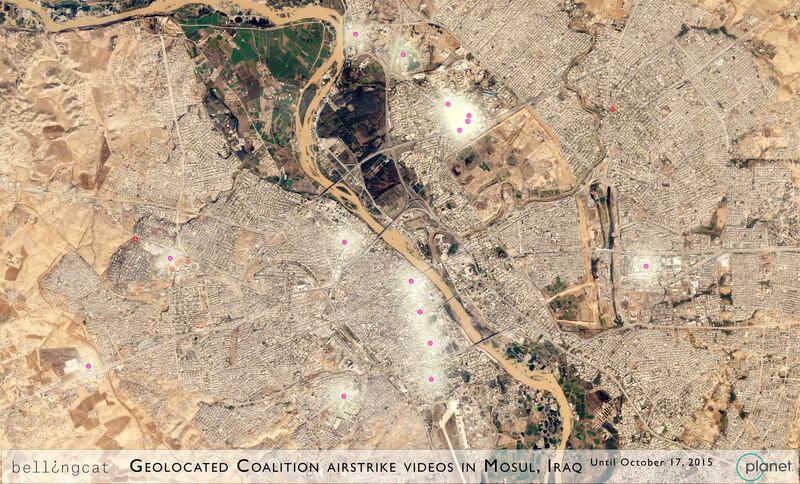 However, Mosul has already been targeted by hundreds of airstrikes over the past year. Airwars, a monitoring organisation of international airstrikes in Syria, Iraq, and Libya, believes 423 civilians have been killed so far by Coalition in Mosul: that’s by far the highest number of casualties in a single location in the campaign against IS. Using satellite imagery provided by Planet Labs, this article highlights several locations where large large building complexes have been destroyed during the past year. The comparison uses satellite imagery from November 12, 2015 and October 17, 2016. 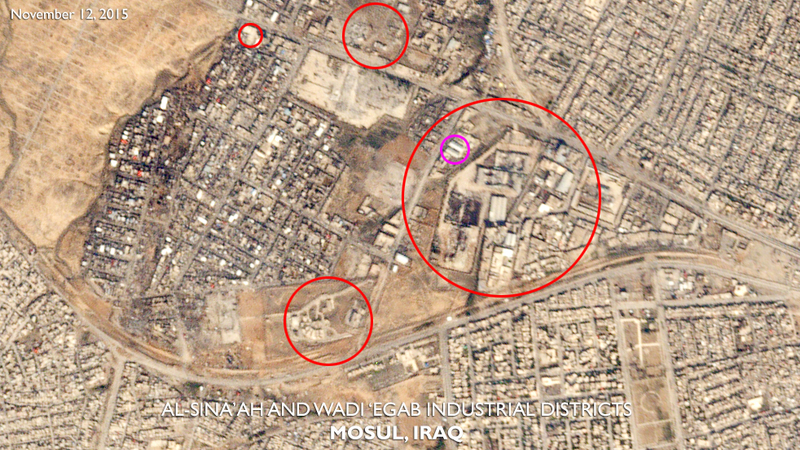 The satellite images enables us to spot larger areas of destruction, which will be corroborated with a variety of sources, including official airstrike videos and IS-linked media. Before and after images captured on November 12, 2015 and October 17, 2016, and provided courtesy of Planet Labs. 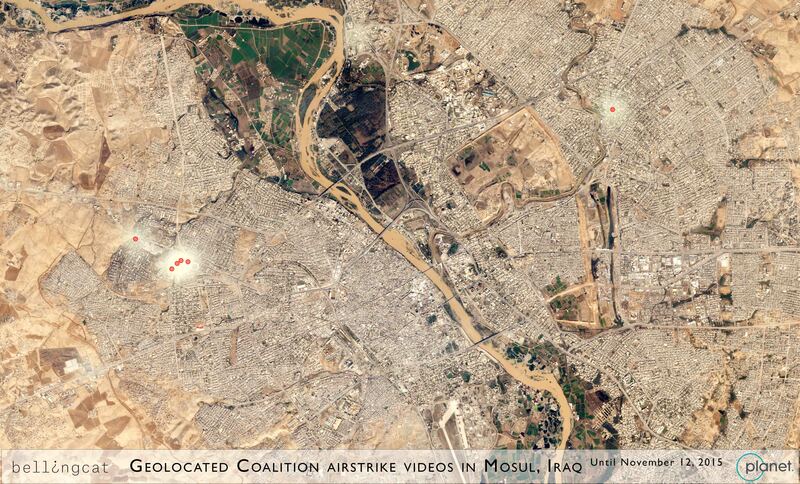 Factories and warehouses in different areas of Mosul have been targeted by Coalition airstrikes. 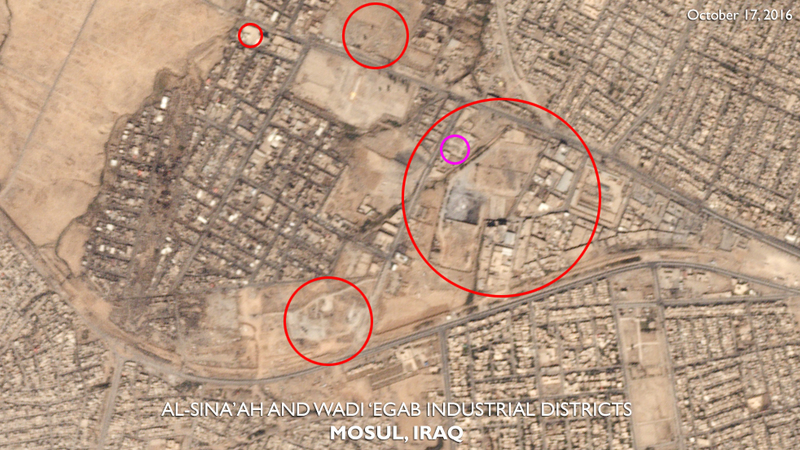 Examples can be found in the Al-Sina’ah and Wadi ‘Egab industrial districts in west Mosul, as shown in the satellite imagery above which shows. The Coalition has published videos showing the destruction of what they designated as storage for vehicle-borne improvised explosive devices (VBIEDs) and weapons on March 19, 2016 (circled in pink), and earlier on September 23, 2015. 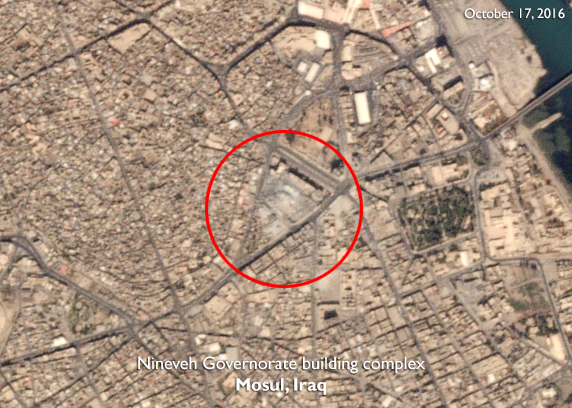 These warehouses were once used by the Iraqi Ministry of Trade, according to a description added on Wikimapia. No civilian casualties were reported by Airwars. 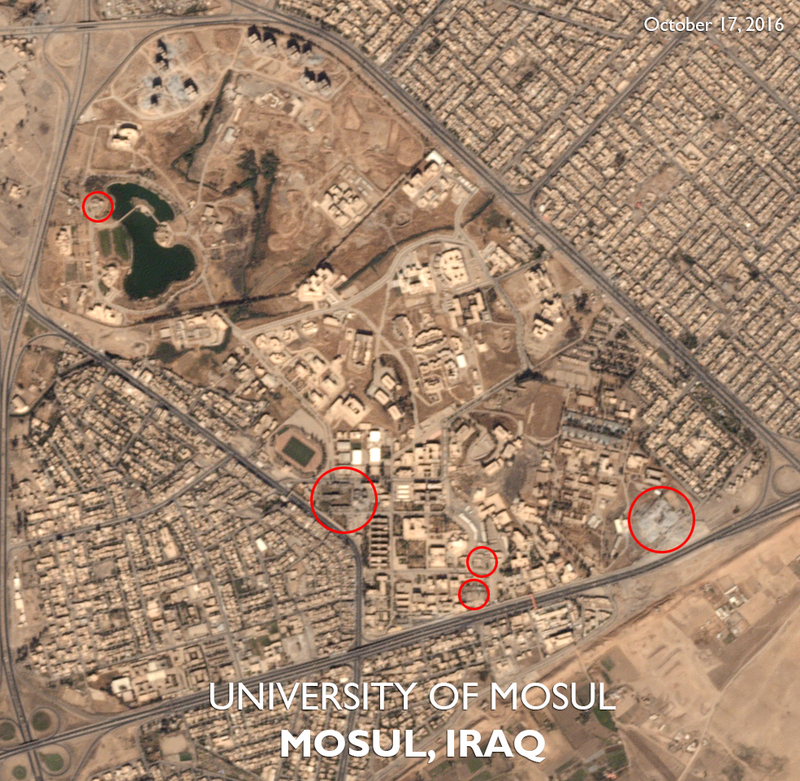 The Coalition has targeted the University of Mosul in at least two different series of airstrikes during the past year. Videos published of several airstrikes in March and May 2016 designated parts of the functioning university, which is occupied and controlled by IS, as “improvised explosive device [IED] factories” and IS “headquarters”. The university used to have around 4,200 faculty staff and over 30,000 students, making it Iraq’s second-largest academic institution. In 2014, the university was closed by IS but was reopened after a few months with new courses and buildings (International Business Times). Physical sciences and languages have been encouraged by IS, as well as medicine, pharmacy, nursing, and dentistry, “filling gaps left by doctors who had fled the city” (BBC). The satellite imagery can be corroborated with official Coalition footage from the air, as well as IS-linked footage from the ground. 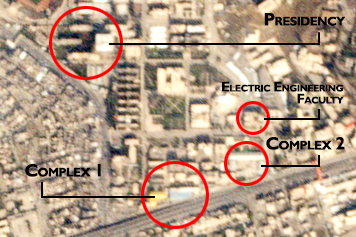 The Faculty of Electric Engineering, which was founded in 2002, was designated by the Coalition as an “IED factory” and bombed on March 14, 2016, a Coalition video shows. 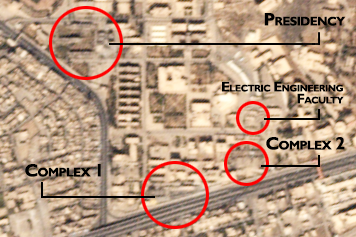 The two buildings just south of the Electric Engineering Faculty (“Complex 2”) , allegedly also “IED factories”, were bombed on the same day as another Coalition video shows. 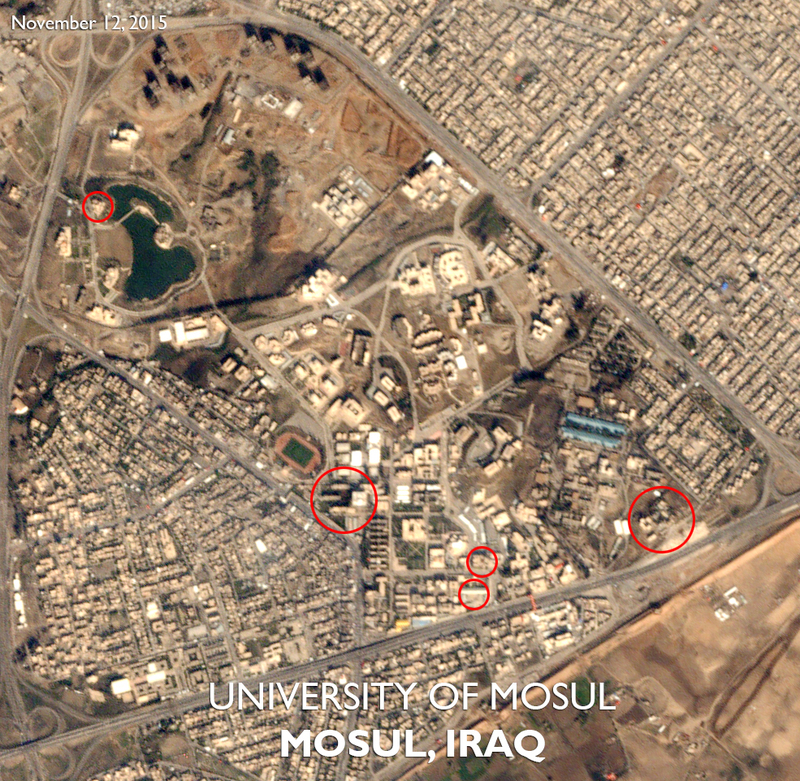 Five days later, on March 19, the Presidency of the University of Mosul and adjacent buildings were targeted by Coalition warplanes, another video shows. Footage published by IS-linked ʻAmāq News Agency showed the same airstrikes from the ground. Two big smoke plumes can be seen above the Presidency building, while the street is littered with shrapnel and debris. Dead bodies are shown later in the video. MosulEye, a blog run by run anonymously by a self-described “independent historian inside Mosul”, told VICE News “that IS had not expected a strike against the university because the surrounding area was full of residents.” The blogger claimed that IS militants were indeed using some of the university’s buildings, and claimed dozens of IS fighters were killed by the airstrikes, which hit the buildings when no classes were in session. However, 15 to 25 civilians may have died and another 80 injured due the air raid according to Airwars, a monitoring organization that tracks civilian casualties due to airstrikes in Iraq, Syria, and Libya. Another ʻAmāq video, dated July 12, showed the British photojournalist John Cantlie discussing the Coalition airstrikes on the University of Mosul. Mr. Cantlie has been held hostage by IS since November 2012. On October 19, it was reported by different media that IS had blown up the Nineveh Governorate building at Jamhuriya street in central Mosul. 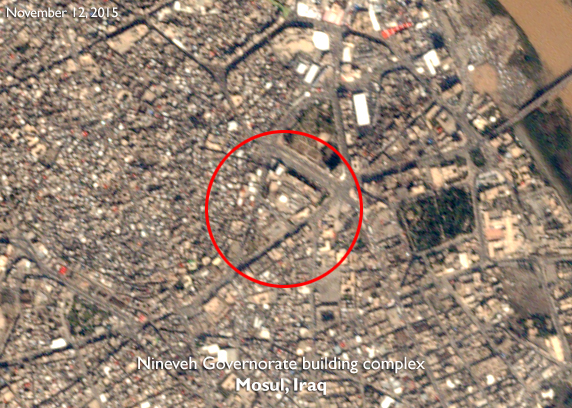 What is clear from the satellite imagery is that as of October 17, a large part of the building complex was already destroyed (some suggest by an airstrike). 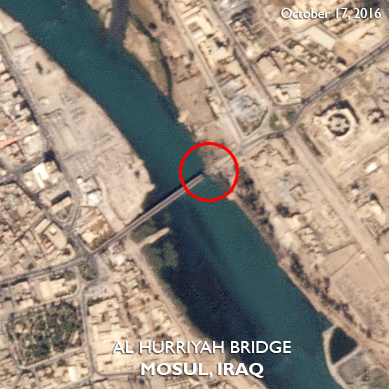 The Al-Hurriyah or Second Bridge was struck by a Coalition airstrike on October 16, according to ʻAmāq, rendering it unusable. Satellite imagery of a day later indeed confirms the damage at the bridge. The same bridge has allegedly been targeted by Coalition aircraft before, as an ʻAmāq published on January 21 showed damage to a different part of the bridge which coincided with a Coalition report of targeting an “ISIL used bridge”. The bridge appeared to have been fixed relatively fast afterwards, Twitter user “obretix” noted. Bellingcat runs an ongoing project to geolocate all Coalition airstrike videos. As of November 1, 2016, the official YouTube channel of the Coalition has uploaded 32 different videos of airstrikes near/in Mosul. 17 videos have been geolocated so far (by several Twitter and Checkdesk users) and its locations are shown on the map below. 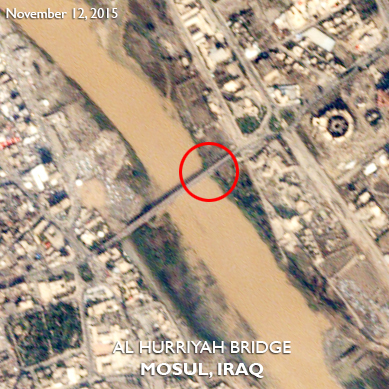 22:30 UTC: Added a tweet with more information on the first airstrike on the Hurriyah Bridge.